Irish stone forts are known as cashels; their earthen equivalent are called raths. These forts are notoriously difficult to date as many are multi-period sites. 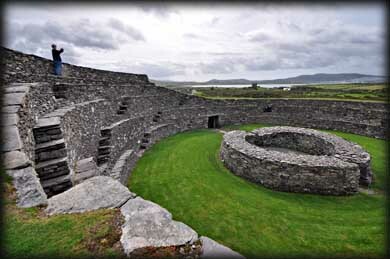 Some of the larger more well known forts like Grianán of Aileach in County Donegal were built within a much earlier Hilltop Fort. These Late Bronze Age hilltop forts date to c.1000 BC but some may be of later construction. 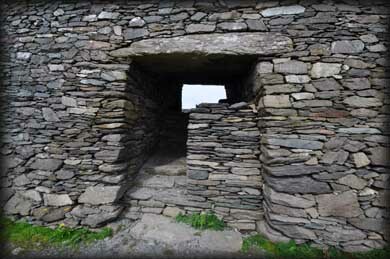 Many of the cashels were remodeled over a long period, such as Dun Aenghusa on Inishmore in the Aran Islands. These islands are an ideal place to visit cashels where there are other superb examples such as Dun Eochla, Dun Eoghanachta and Dúcathair. 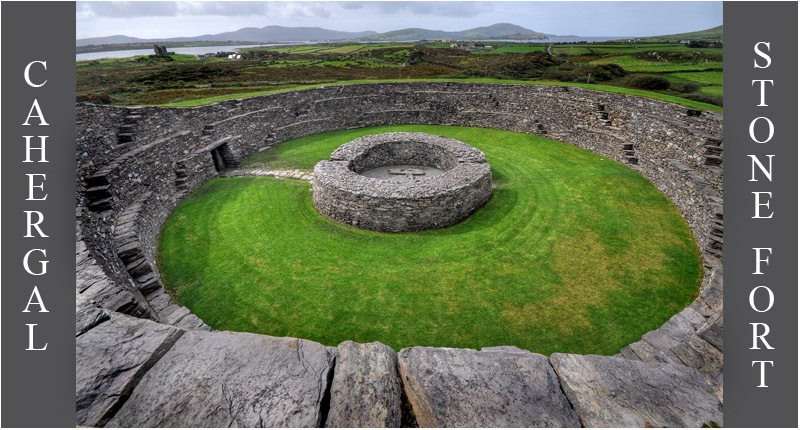 The cashels and raths, collectively known as ringforts, were probably built as defensive homesteads or farmsteads. But some were obviously built by someone of very high status because of the many defensive features and prominent location. 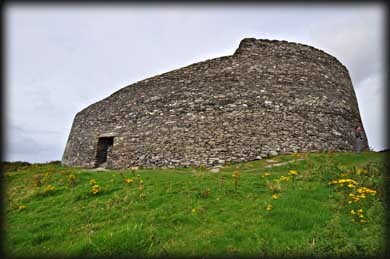 Grianán of Aileach even became a Royal Seat. 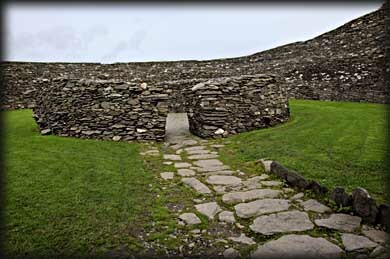 The walls of Cahergal were recently reconstructed and stand to a height of two metres on the western side and rising to about 3.75 metres on the eastern side. The fort is c.25 metres in diameter. The walls are 5 metres thick at the base and lined with terracing on the interior face. Inside the fort are the remains of a circular stone house. The lintelled doorway faces SE. The cashel was probably built between 500 and 800 AD. Further north is another fine example, Leacanabuile. Situated: From Cahersiveen Community Centre turn onto Bridge Street. Signposted Stone Forts. After 800 metres turn left at the crossroads. Then 2 kilometres stop at small Car Park on the right. You can see the fort from here. Go right through the gate at the beginning of the track. Discovery Map 83: V 4482 8060. Last visit Sept 2012.